I make my flowers from 180 gr Italian crepe paper that I like to paint with acrylics so I can control the color theme in every small detail. I do not use any plastics, vinyl, clay, beads, or pre-made artificial foliage or stamen. What kind of flowers do you make? I make a large variety of flower, in different stages of blooming, from buds to fully blossomed: classic roses, peonies, anemone, ranunculus, hydrangea, all types of English garden roses, succulents, scabiosa, jasmine, protea, dahlias, poppies, magnolias, poinsettias, berries, dogwood, tulips, sunflowers, brunnia, freesias, sweet-peas, lisianthus, cherry blossom, field flowers, hellebore, orchids, daisy, all types of greenery and eucalyptus. I like to constantly enlarge my floral range, try new things so, don’t be afraid to ask me if there is a particular flowers you are interested in and I’ll try my best to make it. What kind of work or orders do you take? I make only custom orders. The main area of my work are bridal bouquets… I love weddings and brides so I do my best to make their dream of the perfect bouquet come true. I give a lot of energy and time for these projects but I do find the time to make other types of orders like centerpieces for home decoration, small bouquets for gifts or flower wreaths. From my wedding portfolio I also make boutonnieres and corsages, flower crowns or… I don’t know… try me! Let me know if you’re interested in something different! I sometimes make recreation of real bouquets or wedding bouquets… so if you wish to hold your bridal bouquet one more time, for years to come, or you want to make your wife the most amazing anniversary gift, let me know. I take a limited amount of orders per year so contact me with many months in advance. I also reserve the right to turn down orders beyond my capabilities. Can you send me a price offer for your work? I don’t have a standard price offer because I only have time to make custom orders (I never find the time to make flowers to stock in my studio), so every customer with his/hers requests are unique. You have to let me know your requests so I can make an estimate of the time, workmanship and materials I need in order to make you a price offer. How long does it take you to make my order? You have to let me know your deadline first so I can see if I can make it in time for shipping. I take orders with many months in advance… this is the only way I can arrange my schedule in order to deliver. How does this process work? From placing the order until finishing it. You have to give me an e-mail or private message on my Facbook/Instagram page with all the details regarding your bouquet/order: color theme, flower range, shape and size, etc. You can send me inspirational pictures with my work but I also enjoy images with real flowers/bouquets from Pinterest (I often go to Pinterest for inspiration) or other wed sources. After we establish these details I will make a storyboard with images that capture the style and details of your bouquet, which you will approve (or modify as you wish) and I will use it for my work process. I send pictures with the flowers after I make them and also with the finale bouquet… communication is very easy with me, I’m available most of the time for you, for questions and possible changes. Is shipping secure? Does it arrive safely? Yes, I do my best to make that happen. I use a hard cardboard box wich I sustain with walls of polyester so it doesn’t deform. I also make a support system for the bouquet that keeps it still in the box. The rest of the empty space is filled with tissue paper. I usually send pictures with the inside of the box so you can see for yourself. How should I care for the paper flowers? How long do they last? Paper flowers are ment to last for many years if you take proper care of them. You must keep them away from direct sunlight and moisture! One of the reasons I paint my paper with acrylics is that crepe paper colors fade very quickly because of the natural light. By painting it, not only I obtain the shade and details I aim for, but also, I make the paper more stronger and resistant to natural light. Some paper flowers are very delicate and fragile but I’ve developed, over time, some techniques that make them stronger. I also use a varnish spray with UV protection that will help the paper that isn’t painted not to fade as much. If you find your flowers need dusting, giving them a gentle shake or blowing on them gently should be sufficient. You can also use a soft paint brush to get into the grooves of the paper. The paper flowers I make are generally more resilient than they appear, but you must avoid storing flowers on their sides for long periods of time, and always keep them in a vase. Keep your flowers away from open flames. Do you make workshops or teach? Not for the moment. I’m always busy with my custom orders for bridal bouquets and weddings so I can’t find the time to get involved in other activities. However, I dream that I will make some tutorials one day and share with you some of my techniques… so be patient with me and follow my posts on social media. 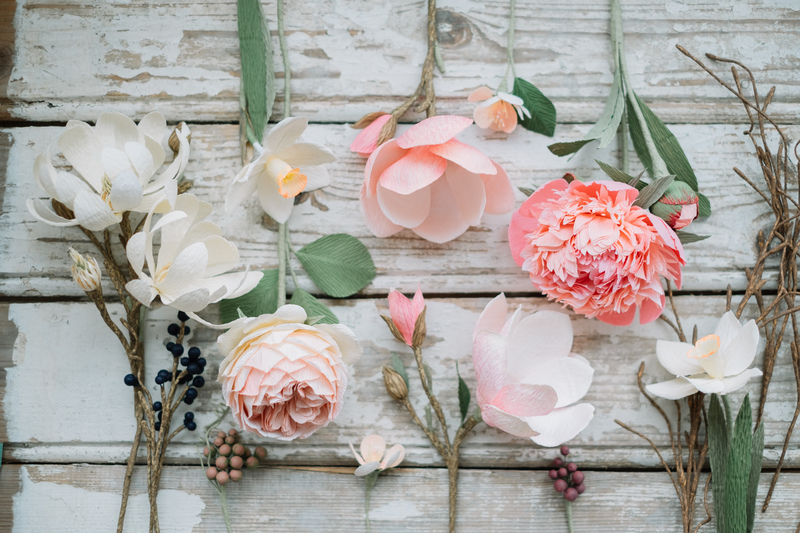 Why are your paper blooms more expensive than real flowers? …or at least they should be, because you have to consider the fact that this is hand-make work, a creative and artistic process in which every paper bloom is made from scratch – the paper is died, every petal is cut, shaped, glued on one by one. It may take a couple of hours to make just one flower. You’re paying for the material cost, the workmanship and also the hours of researching, practice and study, sourcing for the best materials, and experimenting new techniques. I fell that with every project I learn something new and every bouquet is unique because it’s also a work of art. You must know that I pay myself a moderate wage per hour so you can afford to by my creations… I don’t factor the many additional hours I spend researching, designing, managing my business, arranging the order for proper shipping, shopping for supplies and so on. Hi Christine, where are you based? I am interested in a few floral designs for my wedding, but I am in South Africa. Hello, I’m from Romania. I will send a private e-mail with details.